Our mission is to enhance the lives of students in need through sports in schools. Participating in school athletic activities provides a means for students to more meaningfully engage with their education, increase academic performance and attendance and provide life skills taught through sports-based youth development. Many students are on the sidelines due to a decrease in funding of school sports programs, the introduction of pay-to-pay fees and the increased costs of equipment and transportation. Communities and individuals with the most need have been hit the hardest. Without healthy experiences outside the classroom, many young people are at risk of obesity, depression, substance abuse, crime or gang activities, truancy, and dropping out of school. Athletic programs offer a simple and powerful solution. Sports In Schools bridges the gap by tapping into our deep network of athletic directors, professional athletes and organizations, and generous corporate and individual donors to get much-needed funds to kids who need them. Examples include our annual Brock Huard Football camp, Funding for the Aki Karose middle school JV soccer program, equipment donations to Cleveland High School, and Individual sports and cheerleading scholarships to hundreds of individuals. Apply for your athletic program today! Each year, through the generosity of Brock Huard, 710 ESPN radio and other corporate sponsors, we put on a free, one day camp with 150 kids to teach fundamental football skills and leadership lessons. Having been in ten foster homes in the span of three years, Mykel was struggling to find something and someone to connect with. Through her social worker, she was encouraged to try out for a school team. She chose cheerleading. She and her social worker were thrilled when she made the team but were shocked by the $1,500 cost that came with being part of the team. SIS paid these fees, Mykel found a connection and graduated on time. Michael found SIS through our deep network of school and community resources. Having spent his last two birthdays in juvenile hall, Michael and his family, with the help of SIS, provided funds and equipment to help channel his energy towards football. The result? A great school year, a foundational season of football, teammates and coach/mentors, and a new friend in Seattle Seahawk Bruce Irvin. Every year SIS sponsors this event, bringing together the Juniors and Seniors chosen as the Seattle Times Metro All-Star Soccer Players. These student-athletes from the private and public schools that make up the Metro League have the opportunity to play alongside athletes they have been playing against all season. Support a student athlete today! Save the date! This is our biggest fundraising event of the year, helping fund over 1,500 Student Athletes! SIS is grateful for the items that our supporters donate to the auction. We are always looking for special items, such as Seahawks tickets, wine, sports merchandise, vacation getaways, restaurant gift cards, etc. If you would like to donate an item, you can find a procurement form HERE. We are looking for key corporate sponsors for the 2019 auction. In addition to helping the mission, corporate sponsors will receive visibility at a number of different points leading up to and during the auction event. View our SPONSORSHIP LEVELS to see if there is one that would work for you. It's 2008. Sports In Schools founder Will Niccolls showed up to referee a middle-school team in south Seattle and noticed something: many of the kids weren't wearing any socks. "Now most buy-the-book refs will say 'No socks, no game', says Will recalling the day. "It occurred to me that these kids deserved to play as much as the more affluent kids across the field. I had 15 minutes until game time, and there was a Target nearby, so I jumped in my car and came back with socks!" The rest is history. Will is the Referee Program Director for Washington Youth Soccer, overseeing 4,000 referees, including their training and development. He has spent the past 20 years refereeing soccer at all levels and is widely regarded with great respect by collegiate and professional coaches as well as fellow referees. 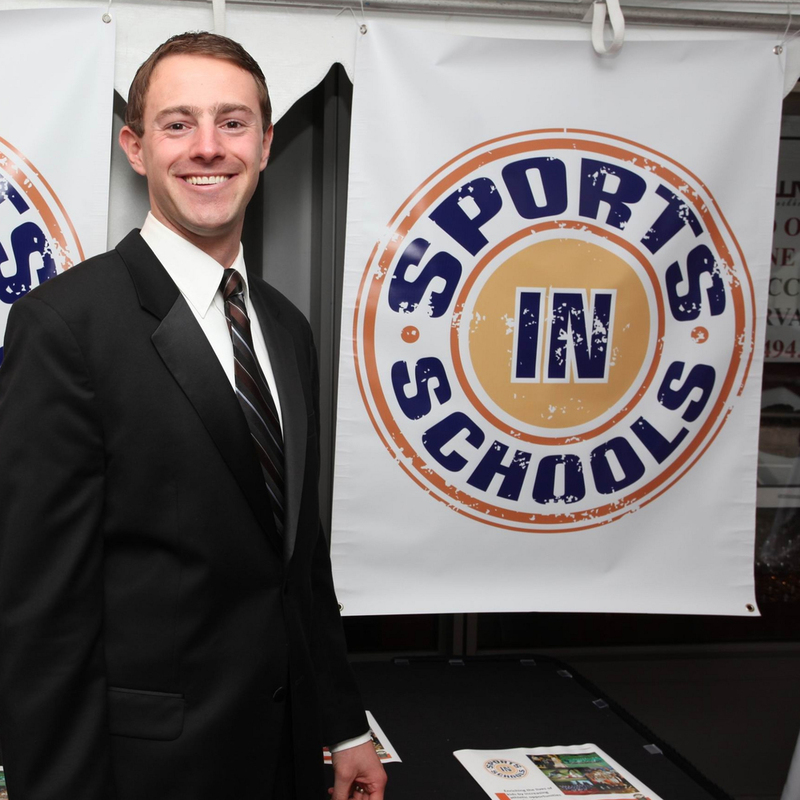 Will co-founded Sports in Schools in 2009 with his wife Kyleen. As Chairman of the Board, Will works to ensure that Sports in Schools gives every kid a chance to do something positive after school, and to provide kids healthy connections to their schools and their peers. He works directly with community partners, athletic directors, coaches and social services to remove financial barriers to ensure that all students have the opportunity to participate in school sports. Sports in Schools and our community are fortunate to have Will making such a difference in the lives of so many kids.